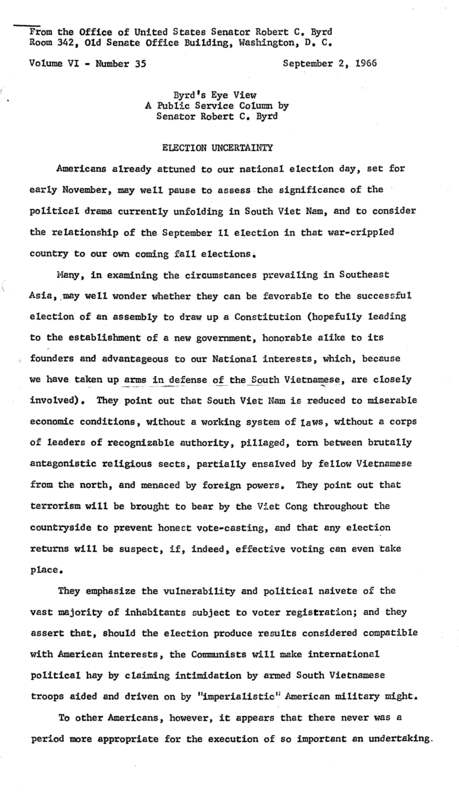 Senator Byrd reported the upcoming election in South Vietnam and pointed to the act as a significant moment in history, and one which justified U.S. involvement in the efforts of establishing a strong democracy in the country in his September 2, 1966 "Byrd's Eye View" column. Robert C. Byrd. "Election Uncertainty in South Vietnam." Robert C. Byrd Congressional Papers. Accessed 19 April 2019. http://acsc.lib.udel.edu/items/show/330.